Hi, this is chronotrig from the Witch Hunt. It’s been a long time coming, but the complete English release of the Umineko main arcs is finally here, and I’d like to talk just a bit about how we ended up where we are now. Our first translation of the series, back when the Japanese releases were still in-progress, started as a fan translation without the knowledge or support of the creators. This was during a time when official translations of Visual Novels, particularly of this size, were almost unheard of. Even fan translations tended to focus on shorter series, and to be brutally honest, we had bitten off far more than we could chew. If not for constant support and encouragement from fellow fans in Animesuki, GameFAQs forums and the other parts of the internet, the project would have died a horrible death many times over. In fact, it’s fair to say that it did die several times before just barely managing to revive itself. Fortunately for us, 07th Expansion and Ryukishi07 weren’t only understanding but outright supportive of our attempts to localize their precious series. We were obviously overjoyed, but as translators, that hit us hard. More and more, it wasn’t enough just to have a reasonably good translation of the series so that English-speaking people could follow along in (somewhat) near real time with the Japanese audience. We needed to do the series justice, and we were finally seeing a glimmer of hope at being able to do so. The classic issue with Japanese translation is how literal you remain to the source material. A completely literal translation sounds wrong and awkward. The first step towards fixing that is to translate an idea at a time. You read a sentence or two, get the whole idea of that sentence in your head, and try to say it in English in the voice of whatever character is speaking. Japanese in particular is so different grammatically that you can’t just go word by word, clause by clause. You rearrange longer sentences in to shorter ones, combine fragments together, and add in subjects and objects that the Japanese language can include implicitly, but which need to be stated in English. The end goal is to trick the reader into thinking you’ve actually translated something, that you’re actually showing them what the original author was showing his audience, just in a different language. But in fact, no matter how closely you try to follow the author’s story, no matter how many details you faithfully keep, you’re still adding and removing bits of information almost constantly. That means you not only need to try and understand every nuance that the writer is trying to convey, but you’ve also got to let go of some gems that just won’t translate well, and add new elements when the common knowledge of the writer’s audience and yours don’t overlap. This, along with the fact that we were rank amateurs, was the main cause of the issues in our early translations. In a mystery novel, if you’re forced to let go of “a gem that doesn’t translate well”, and that gem just happens to be a necessary part of solving the mystery, then you’ve magically transformed the entire work into the fantasy genre. Fortunately for us, Umineko is not a classic mystery novel. Unfortunately, that means we had no idea what unspoken rules we might be breaking, which we tried to solve by remaining hyper-literal to the Japanese whenever possible. The more we learned about the series and its possible answers, the more we were able to add to that bare-bones, rough translation. This is probably the trick to translating any Japanese work. A lot is technical, but a lot depends on how well you can understand the series. Good authors are always saying a lot more than is obvious by the main plot. A large amount of the time spent translating consists of interpreting and re-interpreting as much as you can to keep the original author’s vision alive. Even a seemingly minor point can be connected to the true message an author wants to convey, or it might end up being vital to the next chapter of the story the author’s planning to write. Sometimes, the only way to do an author justice is to continually question your own views on what the author’s trying to say. Fortunately, when you’re working with good source material, this can be the most fun part of the process, and is often an even greater challenge than trying to solve a tough mystery novel. That’s my theory on translating, anyway. The only way to really be a translator of modern Japanese fiction is to be a fan translator. We’ve given it our all on the translation of Umineko, and we encourage everyone to read it as if they’re reading the words Ryuukishi07 himself wrote. After all, a story like this can’t be properly solved unless you have faith in the author and the words you’re reading. However, we’ll continue to work on this translation. If anyone out there sees a problem or a contradiction with it, please let us know, and we’ll do what we can to make this work as close to 07th Expansion’s original vision as possible. That’s why we started doing this, and it’s why we’re still here. 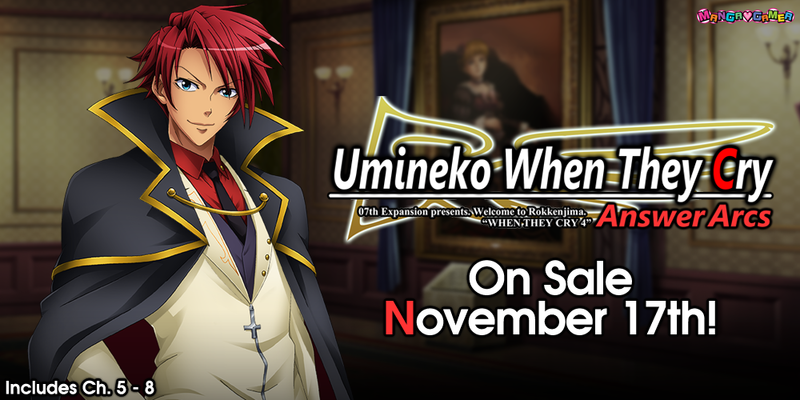 You can pre-order the last four chapters of Umineko: When They Cry right now on MangaGamer.com or wait and pick them up on Steam upon release on the 17th!